Kik is also known as Kik Messenger. Basically, it is a messaging app for mobile phones. It works similarly as Facebook Messenger, Viber, etc. Kik is a freeware instant messaging mobile app available free on Google Play Store and App Store. It needs Wi-Fi plan or a data connection which gives internet to your mobile.The steps to involve Reset Kik Password are mentioned below. First you need to download and install the Kik app from Google Play Store if your phone is android or you need to download from App Store for iOS Apple phone. After downloading and installing on android phone, you need to open your app. After you open your app, you need to choose between sign up and log in. There you need to choose Log in. after you tap on login, you will see two blank space, one log in button and some texts. You need to enter your username or email address and password to log in. If you forgot your password, you need to tap on “Forgot?” text in side of password blank. The text is colored in blue which is internal link. After you tap on that, you will open to next screen with your mobile browser. 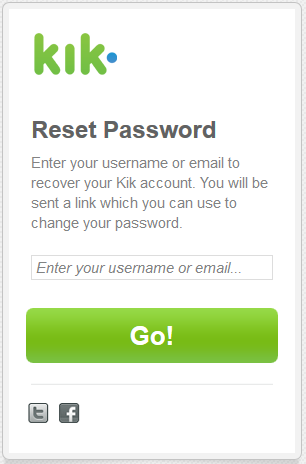 The link for reset password of Kik on your mobile browser should be https://ws.kik.com/p. There in that screen, you should enter your email address or your username in blank space and continue forward by clicking on “Go” with green button. After that a message in same screen that, “a link has sent to your email address”. So, you need to check your email address for the reset link. There you will see “Change your Password”. You need to tap on that and a page with two blank space and go button will appear on screen. There you need to enter your new password in both blanks. Second time you enter will be for confirmation. And after you have entered the new password in both, you need to click on “Go”. After you click on “Go!” you will get a text saying, “your password has been successfully changed”. Then after that you can go back to your app and continue signing with your new password. If you are using your friend’s or someone another’s device than you should remember to sign out before leaving. To use the app, it does not need any extra permission of yours. Someone may send inappropriate messages to others. This entry was posted in Account Reset Password and tagged change kik password, Forget kik password, Kik Account Recovery, kik password, kik password reset, Recover Kik Password, Reset Kik Password on March 27, 2018 by jcgbyHvNvn.